When someone you love has been diagnosed with dementia, both your worlds are changed forever. For one thing, your verbal interchanges are impacted as their memory falters, along with the ability to remember simple words and phrases. This is also true for activities they used to take for granted. Seemingly simple things they would do and enjoy may no longer be possible. At least not in the same form they were used to. Do your homework. Make a list of the things you know your loved one has always enjoyed doing. For each activity, identify ways it can be modified to fit their abilities. Being ready in advance will help you react more calmly when the situation arises. Pay attention to physical limitations, as well as cognitive limitation. Remember, dementias, such as Alzheimer’s disease, involve declining physical abilities as well as cognitive ones. That means, something as simple as gardening can become more taxing. Make modest adjustments at first. Instead of assuming that dad can no longer take his usual walk around the block, find a way to have a friend or loved one accompany him on each walk. A shorter walk can be satisfying and less taxing as well. Keep focused on the moment, not the end result. If your mom loved to knit, she may take longer to do so now. Her work may become less than perfect. Don’t try to correct her. Remember it is the process that is pleasing, just as much as the finished product. Introduce new activities. As some of the “old favorites” become less feasible, find new activities to gradually replace them. If dad loved to do crossword puzzles, consider replacing that activity with jigsaw puzzles or simple art projects. Don’t give up. This is a process and you will make your share of mistakes. Watch your loved one closely for signs of anxiety or fatigue. Don’t insist on doing something just because it makes sense to you. If he or she is not enjoying it, let them rest and try out something new. 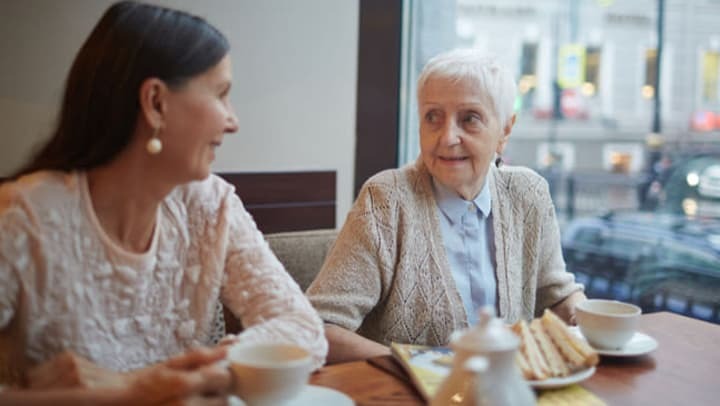 The Alzheimer’s Association has an active online community with lots of great activities for those with dementia, which you can access here. By taking the time to adjust old favorite activities and identify new ones, you will find yourself replacing “Mom, you can’t do that anymore,” with more reassuring words, like “Let’s try it this way, mom.” Making adjustments, identifying new activities, and changing your approach will make both your loved one and your own experiences together calmer, more satisfying and much more enjoyable.